Montauk State Park preserves a shady green retreat that offers visitors plenty of opportunities for fun, whether it is fishing, camping, hiking, picnicking or just relaxing with friends and family. The park is located at the headwaters of the famed Current River. The park’s springs combine with tiny Pigeon Creek to supply more than 40 million gallons of water to the river each day. The cool spring water is perfect for rainbow trout and this makes the park popular with anglers. Picnic areas and two picnic shelters provide the perfect place for a quiet lunch or a family reunion. 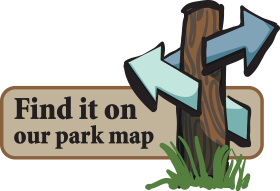 Three trails provide hikers and bicyclists with an easy way to explore the park. Tours of the gristmill, built in 1896, give visitors a taste of the past and help them learn about the history of the Ozark region. For visitors wanting to spend the night, the park offers a variety of choices, including a modern campground, rental cabins and motel rooms. The modern dining lodge will satisfy any appetite. Quiet Hours: 10 p.m. to 6 a.m. Late arrivals for lodging and camping should remain quiet during check in after 10 p.m.